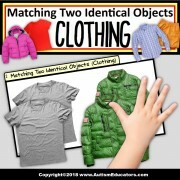 Special Education resource for MATCHING TWO IDENTICAL OBJECTS. 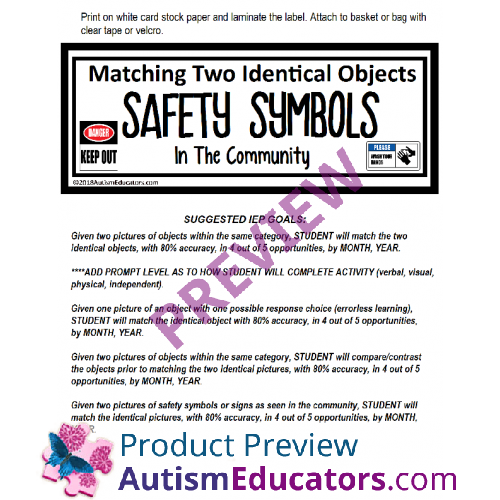 This "Teaching Task Card" set focuses on recognizing Safety Signs and Symbols within the community. Included are signs commonly seen by young children, adolescents, teens, and young adults. WHAT ARE “TEACHING TASK CARDS”? 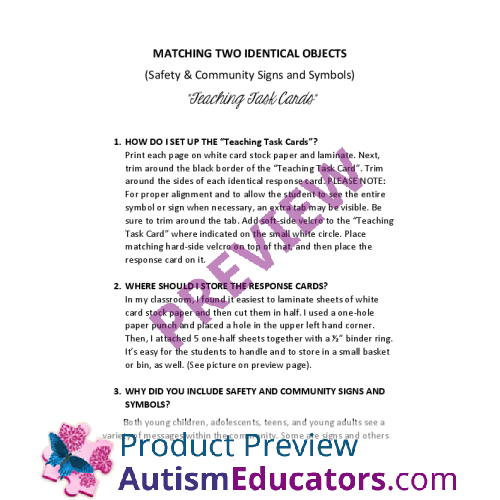 “Teaching Task Cards” are activities that can be implemented in a Special Education setting, Resource classroom, or during Speech and Language Therapy sessions. Each “Teaching Task Card” set enables students to access life skills and academic learning standards. 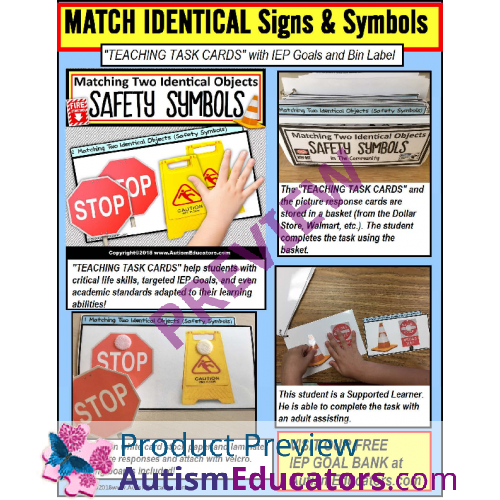 ALL “TEACHING TASK CARD” sets use real life images so children with special learning needs can associate these objects in their daily lives. WHAT IS INCLUDED WITH THIS “TEACHING TASK CARD” SET? 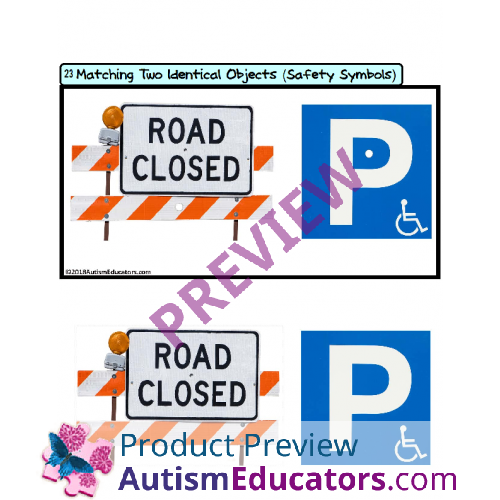 · 40 Matching Two Identical SAFETY SIGNS AND SYMBOLS in the Community “Teaching Task Cards” AND 80 MATCHING RESPONSE CARDS! 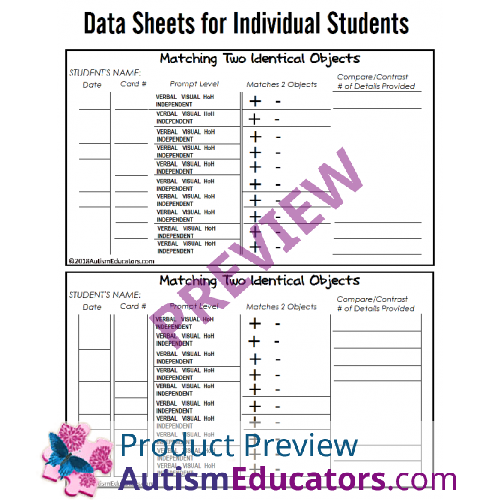 · Data Sheet to record student’s progress. CAN YOU PROVIDE A LIST OF THE SIGNS AND SYMBOLS INCLUDED IN THIS SET? Sure! Here’s the list in numerical order. 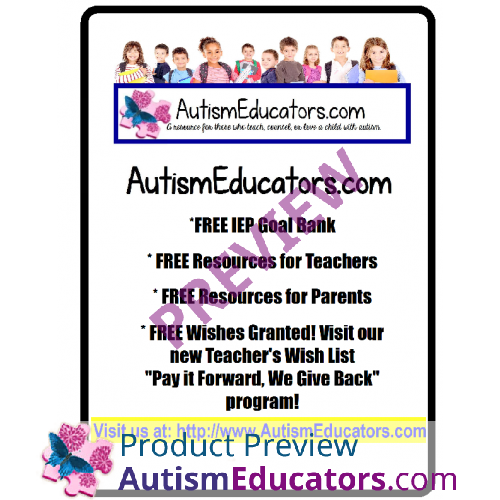 WHICH IEP GOALS ALIGN WITH THIS “TEACHING TASK CARD” SET? 1. 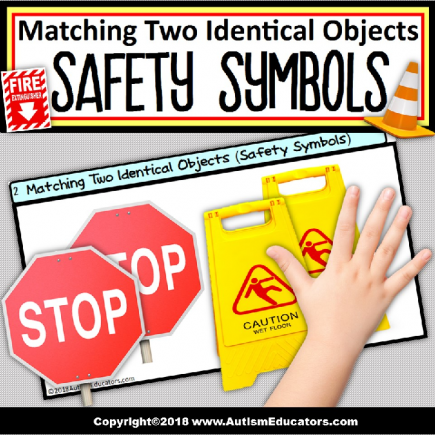 Given TWO pictures of safety signs or symbols, STUDENT will match the two identical pictures, with 80% accuracy, in 4 out of 5 opportunities, by MONTH, YEAR. WILL YOU BE ADDING MORE SETS AND DO YOU TAKE REQUESTS? 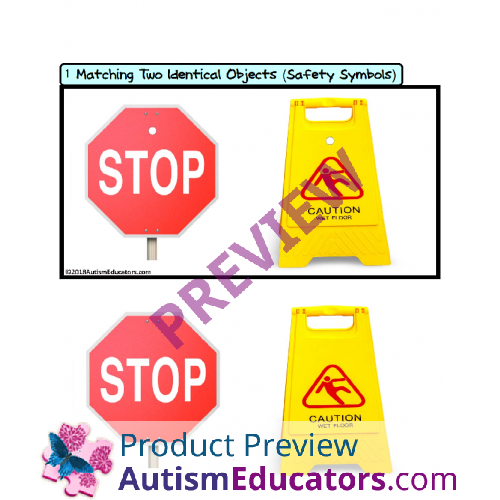 © Copyright 2018 Autism Educators, Inc. (AutismEducators.com). All rights reserved by author. This product is to be used by the original purchaser only. Copying for more than one teacher or classroom, or for an entire department, school, or school system is prohibited. 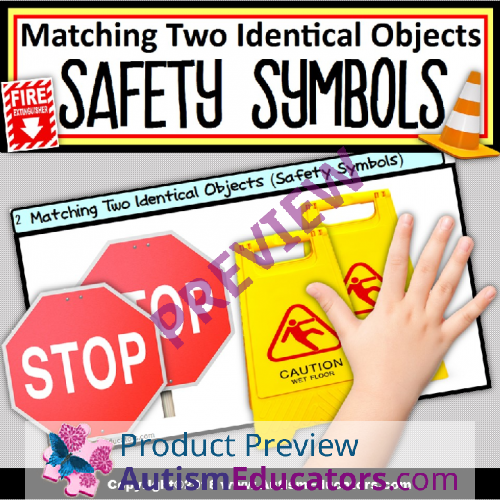 This product may not be distributed or displayed digitally for public view, uploaded to school or district websites, distributed via email, or submitted to file sharing sites. Failure to comply is a copyright infringement and a violation of the Digital Millennium Copyright Act (DMCA). Intended for single classroom and personal use only.